Omaker is a technology company based in California. They make electronics with the user in mind. They want to make technology easier to use and more accessible to the average person. Their products are also built to last. Their designs are sleek and created to increase usability. They manufacture cables, power sources, and audio equipment, amongst other things. Their products include a 12-month warranty. Omaker emphasizes the importance of customer service. Their M4 Portable Bluetooth 4.0 speaker is one of their most popular products. It is durable, functional and affordable to provide the best service to its user. When searching for a waterproof speaker, there are a few things to take into account. The first is durability. This includes water, shock and dust resistance, as well as sensitivity to overheating. Electronics can be water resistant or waterproof, and there is a difference. Most waterproof﻿﻿ speakers will be built to be water resistant. That means your children can kick water on it as much as they want and your speaker will suffer no damage. These are perfect for showers, rain, and pool-side use. Others are completely waterproof. They can float on water or even be completely submerged with no damage. For most speaker uses, water resistance is sufficient. Water will alter the sound quality, leaving it muffled. Speakers that work underwater are configured to work underwater. They usually will not work on dry land. Being dust and shockproof is an extra bonus. You can bring it with you to the beach or on a hike without fear of dropping it or dust destroying it. Other important features are the sound quality and battery life. Many small speakers offer tiny trebles and warbling bass, with very little volume. However, portable speakers are affordable today. They quality ones will have comparable prices to the poor quality ones. Battery life is also relevant if you plan on taking your speaker on hikes or in the car. The Omaker M4 Portable Bluetooth 4.0 speaker is highly durable. It can withstand heavy water splashing and can withstand drops with its shockproof shell. It is also dustproof. The battery life on the M4 is impressive. The battery is built-in and rechargeable. No more rushing out to buy wasteful AAAs! The battery lasts about 12 hours on a three-hour charge. It charges with any basic micro USB cable, so you can use the same cable for your phone as for your speaker. The M4 utilizes the latest Bluetooth technology, Bluetooth 4.0. Most speakers are still using Bluetooth 3.0. Bluetooth 4.0 connects to devices faster and easier. It is less likely to drop the connection, as was common with Bluetooth 3.0. It also uses less battery power to boost the battery life of your phone and your speaker. It does have the same 33-foot range as Bluetooth 3.0. The sound quality of the M4 is unbelievable, considering its size. It has a 3-Watt audio driver, meaning it can fill a room. But, the volume won’t be sufficient for a gathering of more than three or four people. A subwoofer is built into the system, leaving your club mixes with a heavy kick drum with no rattling. Although the Omaker M4 is not overwhelmingly loud, the sound is clear High Definition. The speaker just plain looks nice. It has a simple, square design that comes in three different colors. It comes with a lanyard for carrying or hanging, and is lightweight for portability. It also has an auxiliary jack to connect to your devices manually. A padded carrying case is available for purchase to keep all the cables together. It will also protect your speaker when not in use. 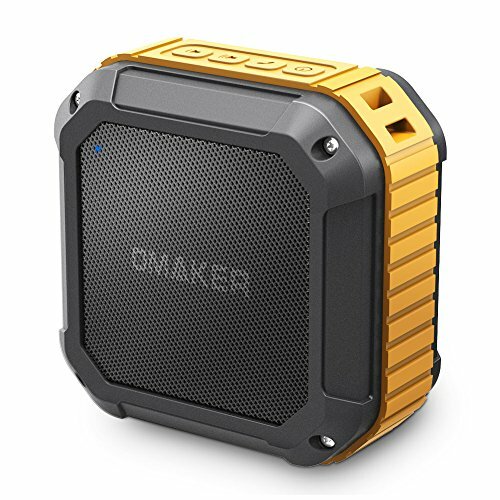 So how well does the Omaker M4 hold up against the basic waterproof speaker criteria. The Omaker M4 has the strongest durability you would need for most speaker uses. It is water resistant, shock proof and dust proof. It is backed up by a one-year warranty, so you know it should be around for a while. With a 12-hour battery life, it is one of the longest batteries you will find. The M4 also has Bluetooth 4.0. The standard for speakers of its type is Bluetooth 3.0. The connection is smoother and quicker. It’s also more energy-efficient, and probably has a lot to do with its long battery life. It has an auxiliary jack and cable, so you know it can connect to everything you own. It also comes with a micro-USB charging cable and a lanyard for carrying. A built-in microphone brings hands-free capabilities. Omaker has clearly put a lot of work into this speaker. It is high quality and affordable. The Omaker M4 brings lots of awesome features to the table. It is a high value for the price paid. Overall, it is the best portability and sound quality you will get in the price range. Check out the other options in the waterproof, outdoor, and garden speaker information on our site.